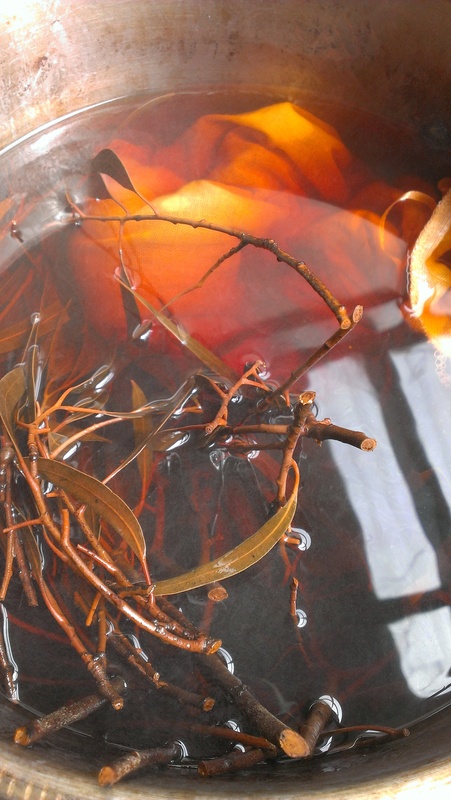 I began the final stage of preparation for my natural dyeing workshop by packing the car to capacity the night before and steeping logwood and madder in hot water. 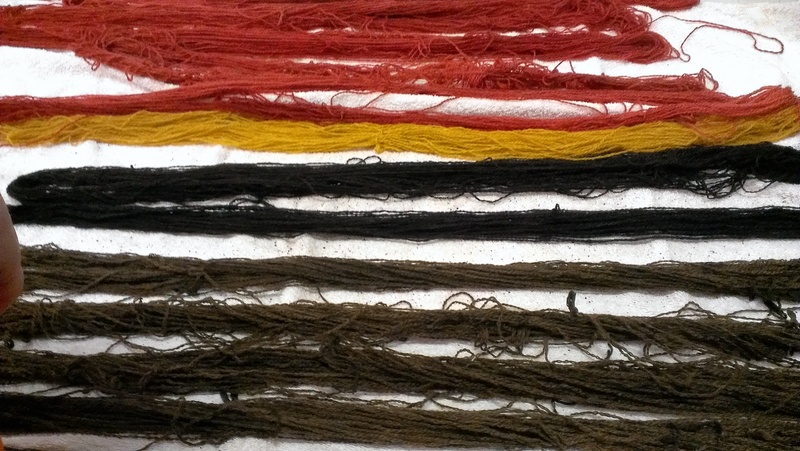 These are more of the dyes that have been left at the Guild. It seemed good to share them with other Guildies this way. The unpacking was quite a thing. 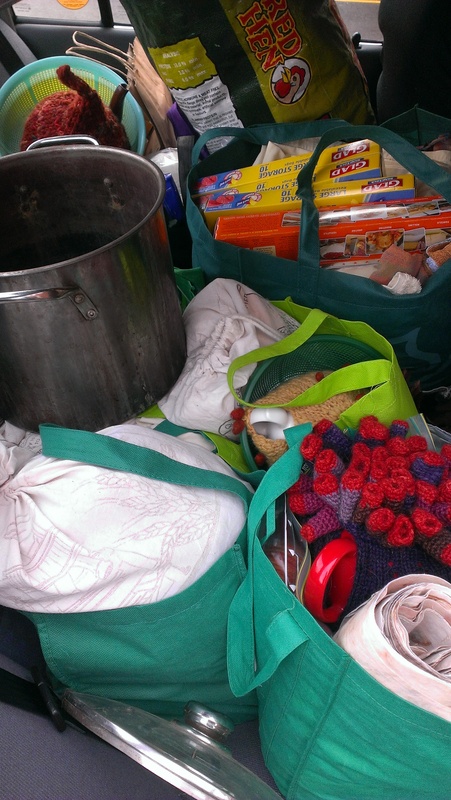 This is a view of the back seat of the car before unpacking. 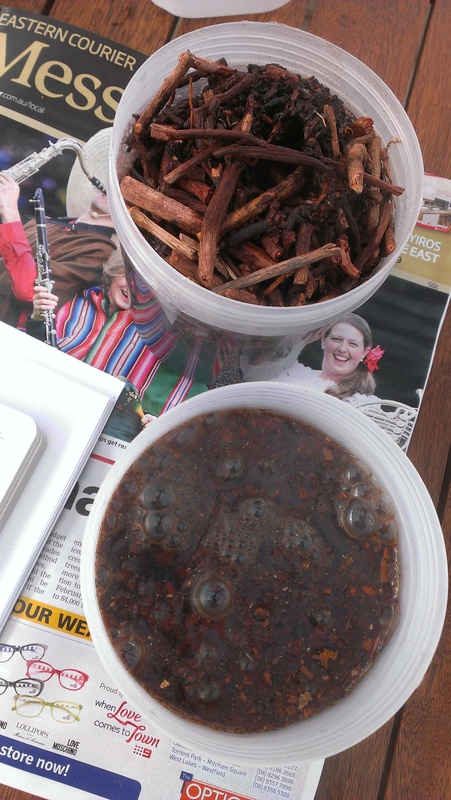 The steeped fermenting walnut hulls (another dyestuff left at the Guild) travelled in the front seat footwell, in a pot with a lid, in a big bucket in case of spills. No spills. Whew!! I put heat under them an hour before people arrived in hopes of getting it over with. My friends, I will never do this again. It may take me years to live down the smell this dye pot gave off! At one point when a heater went on, someone told me they had found a dead mouse in the heater. When I went to see, they were looking for a mouse they were sure must be in there because they could smell it. Cough! The women who were rostered on in the Little Glory Gallery in another part of the Guilds premises exclaimed. So did the treasurer, who came in to work on the books and was similarly appalled. 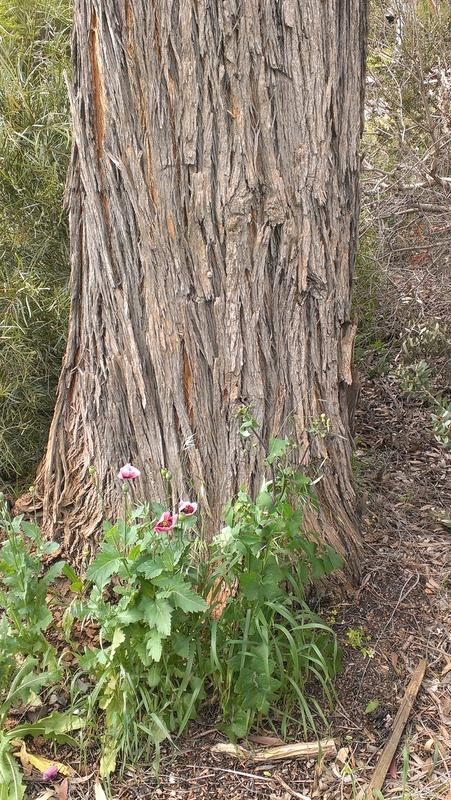 Eventually walnut tailed off and a eucalyptus bark dyepot began to prevail. 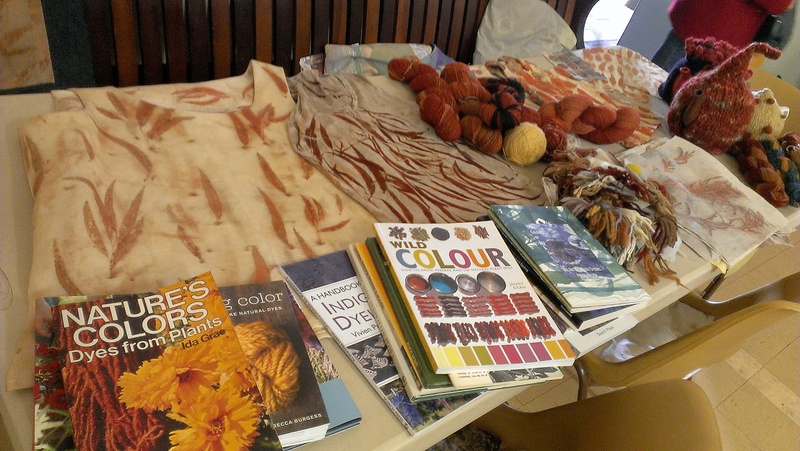 The smell of natural dyeing had people who had come to the gallery wanting to come and see what we were doing all day! I give you the walnut hulls I will be living down at the Guild for years to come. They produced an inky dye. Truly impressive. I set up a bit of a display table of yarns and knits, leaf prints, tea cosies, sample cards and books. 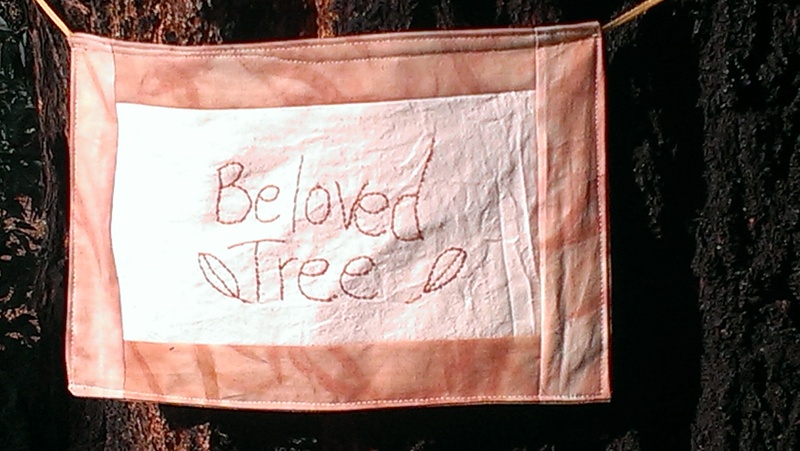 People had their first go at India Flint’s eco-print technique. Some had read the book but never tried it. I don’t know how people can resist! The Guild has a copper which had been repaired because we were planning to use it. Use it we did! 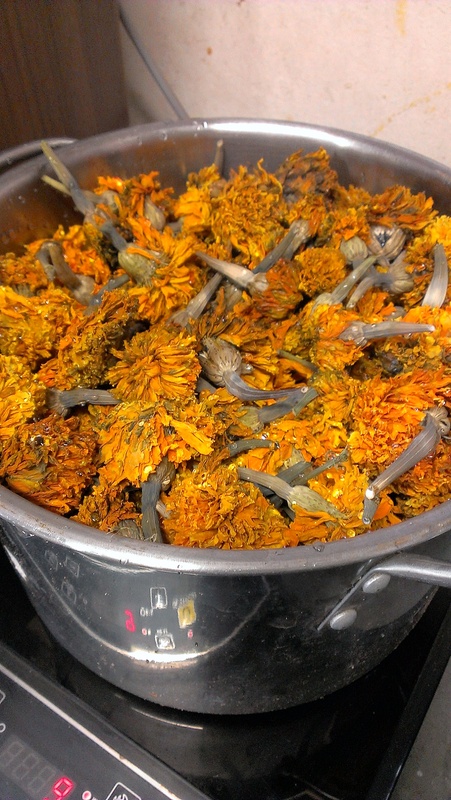 My Mum deadheaded her African marigolds for me through summer and they made a great yellow. 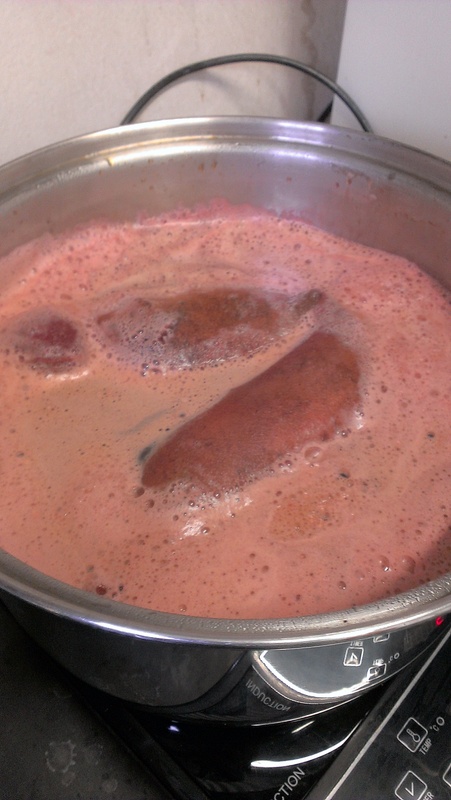 I tried grinding the soaked madder in a blender as Rebecca Burgess suggests (the second hand blender was pretty challenged) and here it is in the dye bath, in its own stocking… we got some lovely reds. 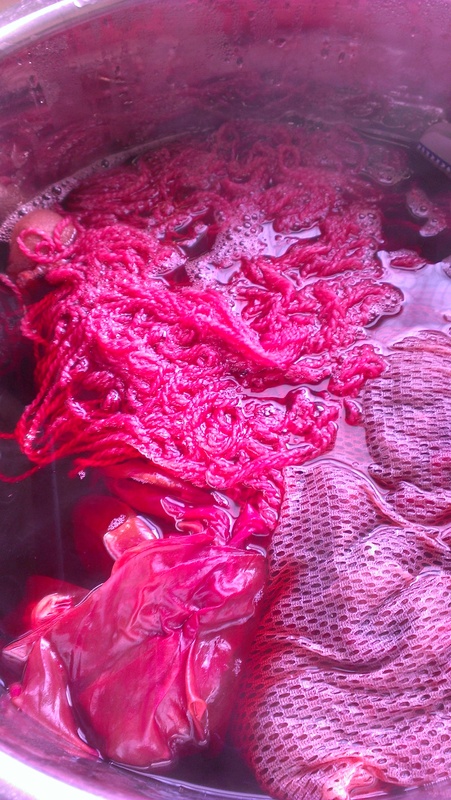 I used one of the bottles of pre-ground cochineal that had appeared in the dye room cupboard. The colour was entirely startling! 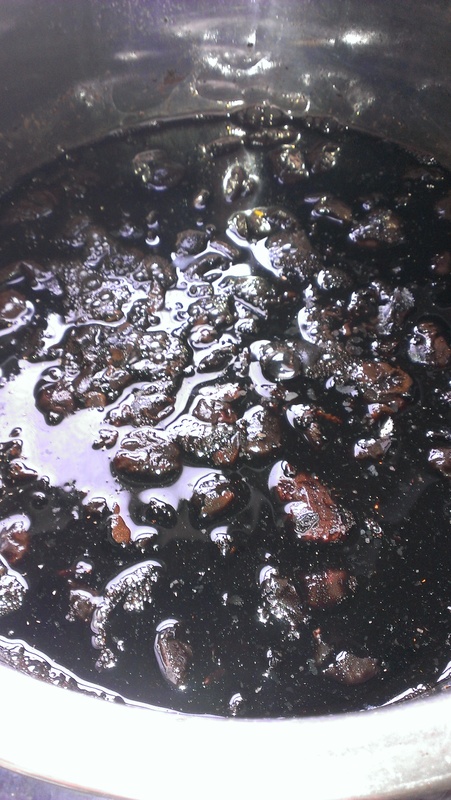 There was a pot of logwood that came out so deep it was virtually black. 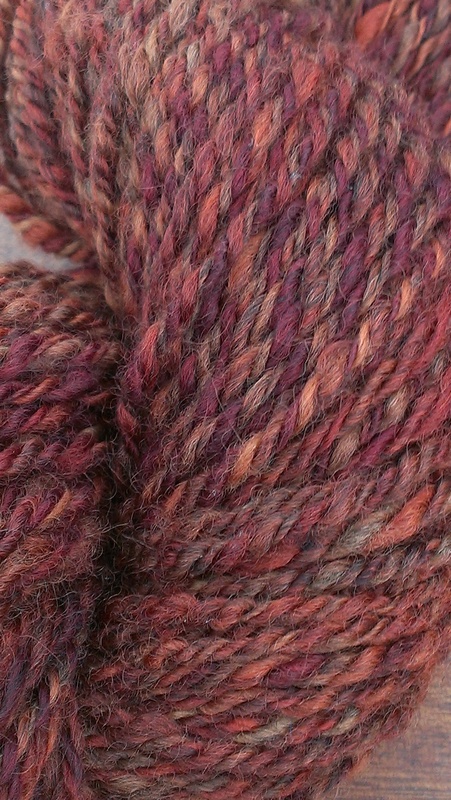 There was a pot of E Scoparia bark that gave some burgundy on the first round and some tan for a skein added in later. There was an E Scoparia leaf pot and an E Cinerea leaf pot–oranges of different shades. 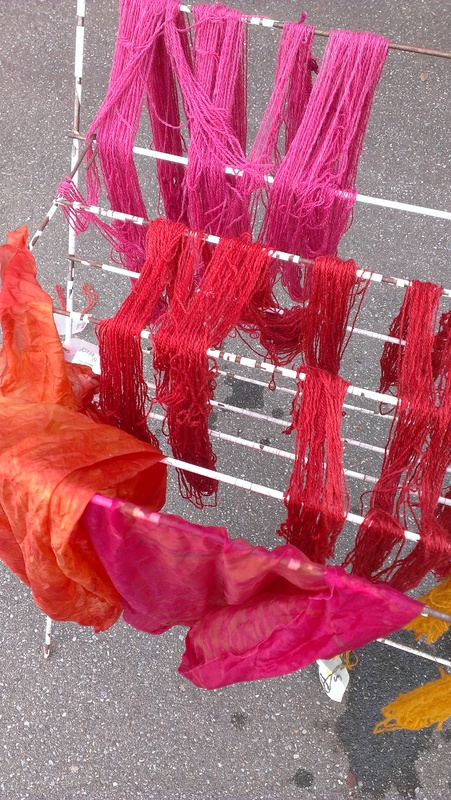 The dye room at the Guild has four gas burners as well as the copper–so we went wild. 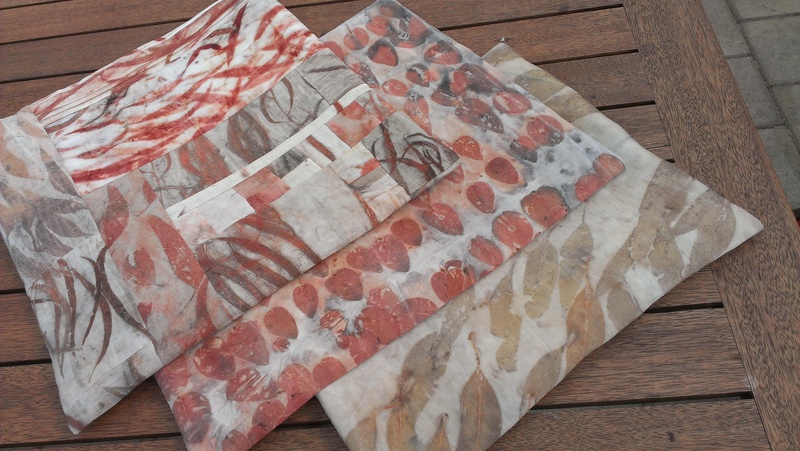 The wonder of unwrapping eco print bundles never wears thin! 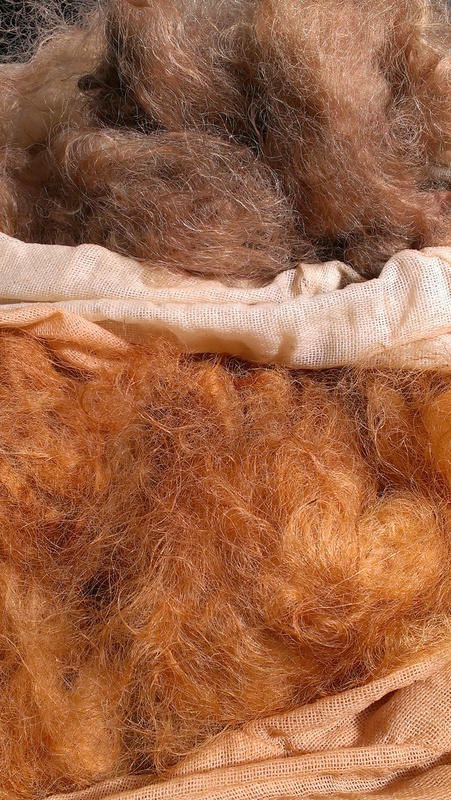 I used the opportunity of being at Beautiful Silks in March to acquire organic wool as well as silk noil twill and some silky merino for this workshop. E Cinerea did its wonderful thing. 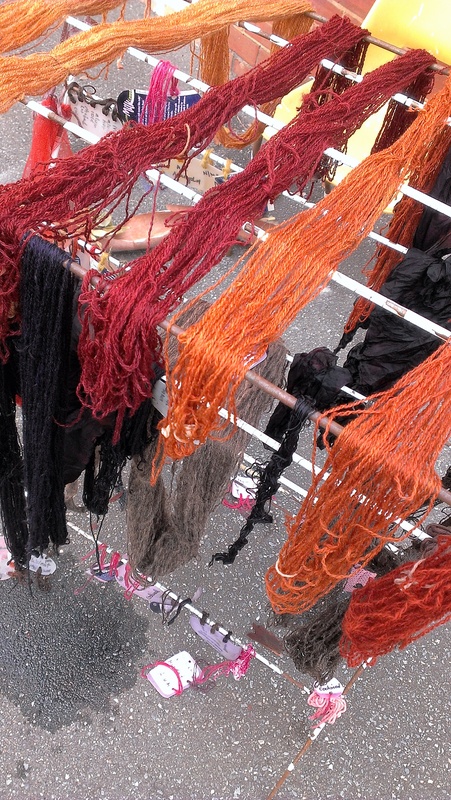 It was overcast and the results of the dye vats which were the focus of the day are seen here in all their glory drying in the Guild car park! These are eucalyptus and logwood. These are cochineal, madder and marigold. 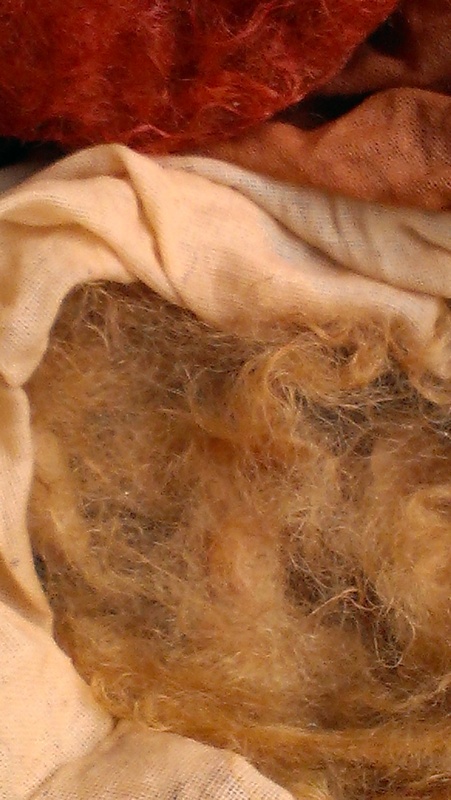 I had mordanted some silk paj in alum and taken it along. 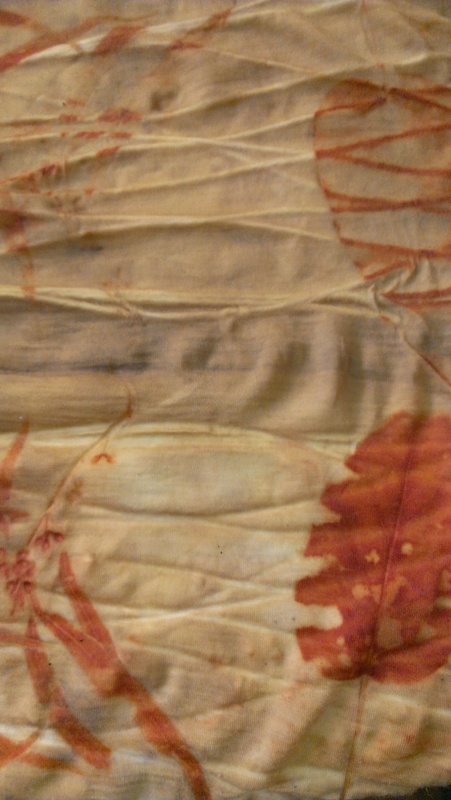 I tried eco printing it years ago and didn’t think much of the results. 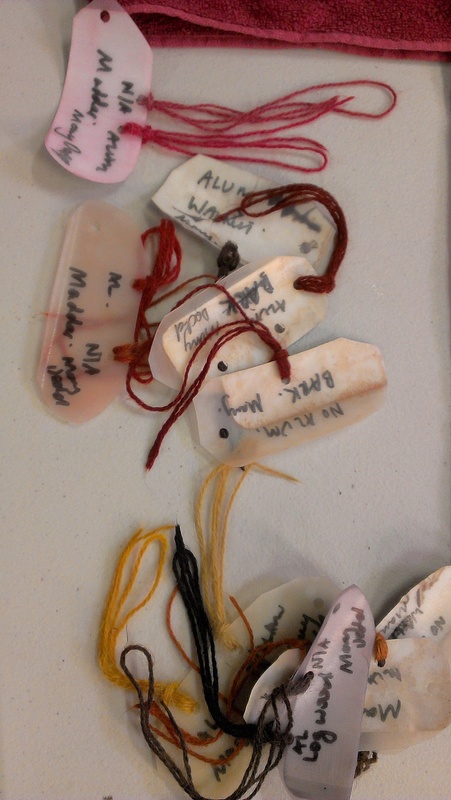 Wendi of the Treasure suggested jewellery quality string (which sounds very promising to me), so I’d been planning to eucalypt dye them–but took this opportunity to expand my palette. 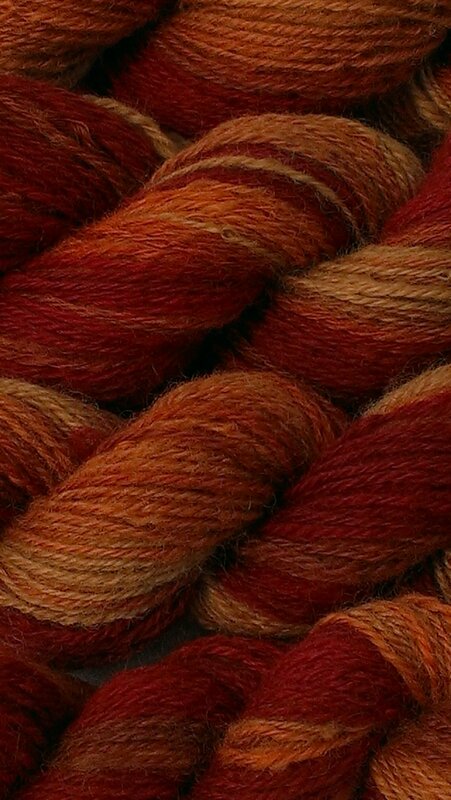 The silk went orange in the madder bath even though wool in the same bath was much more red–still good. People made their own series of test cards too. 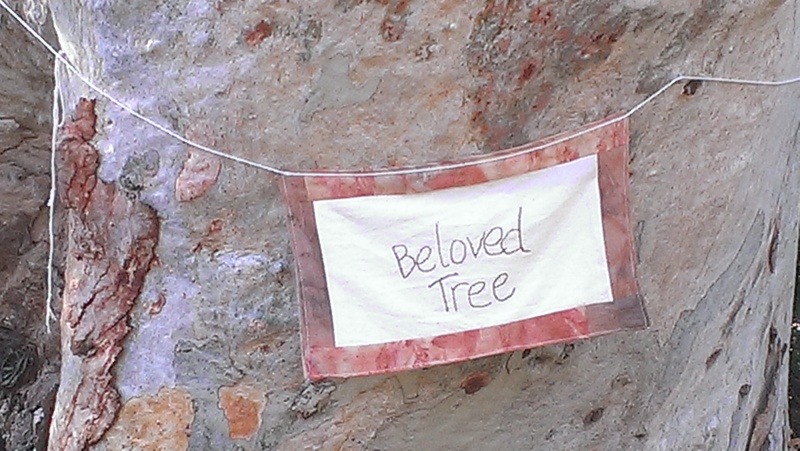 The ‘Beloved tree’ banners are out in the neighbourhood. A bunch of us put up the first couple, and I pedalled around attaching the rest on Mother’s Day. 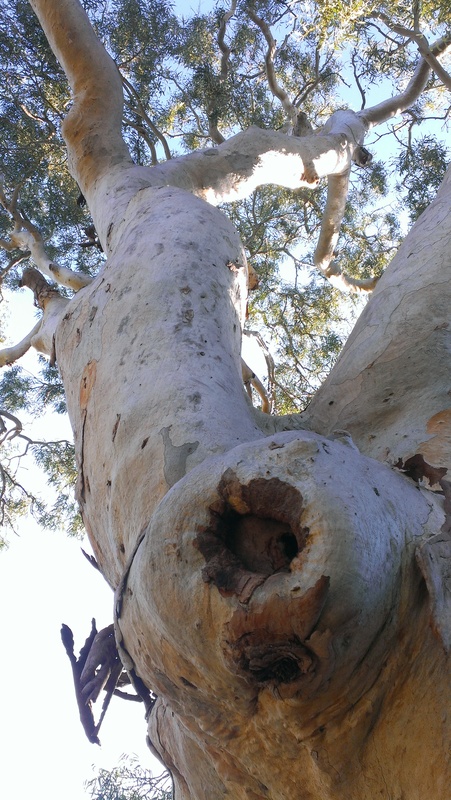 This one is on a massive ironbark. 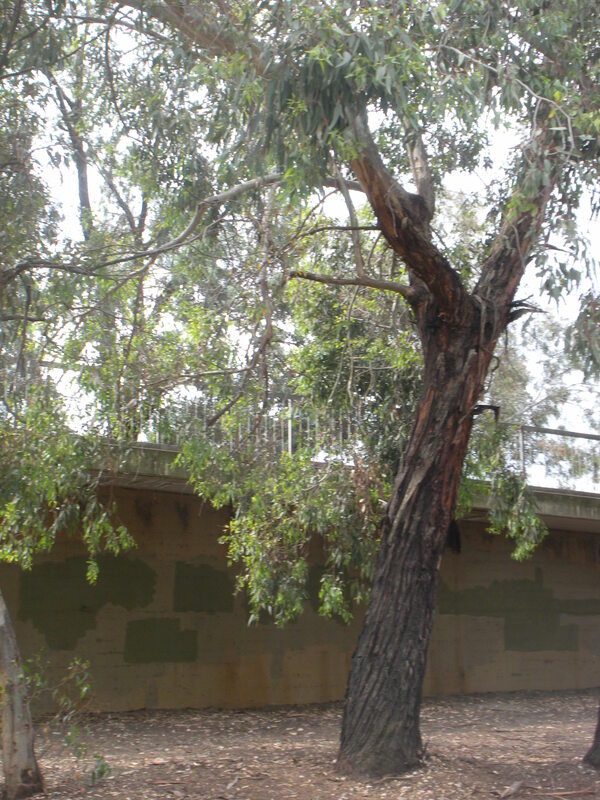 It stands beside the tram bridge in Goodwood. 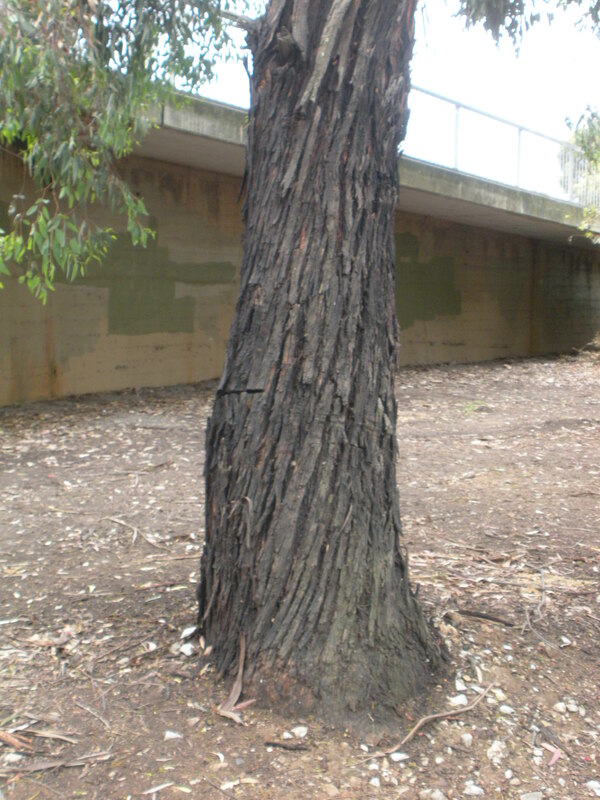 This one is dwarfed by a huge E Camaldulensis in a park beside Brownhill Creek. 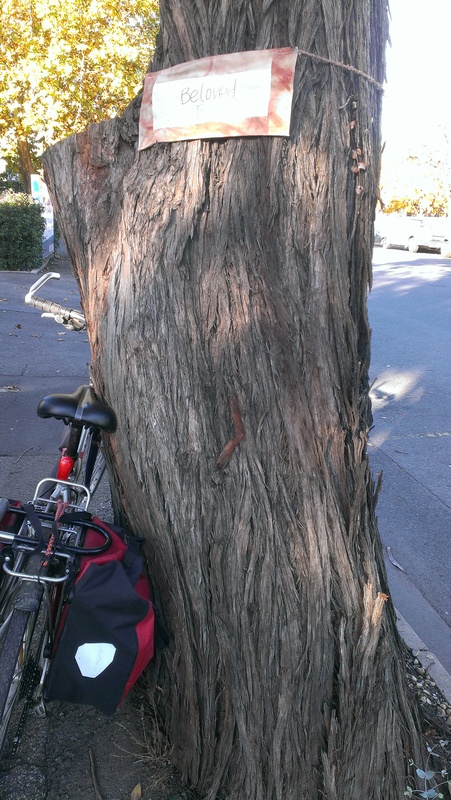 This trunk has survived a lot of depredations, whether human, animal or insect. 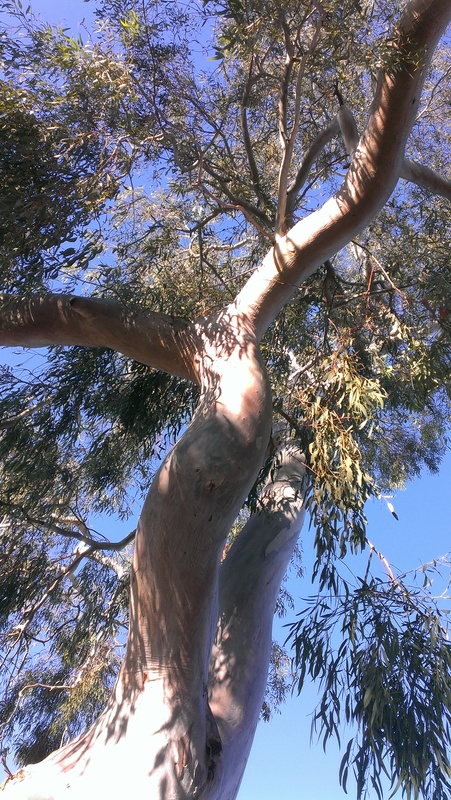 But it is hard to show all there is to see when you stand beneath its curved limbs and beside that massive trunk. Needless to say it isn’t all about what you can see, in any case. This is the place where lorikeets sometimes nest. I’ve seen them wiggling their way in through the hole they have nibbled out of the pace where a branch used to be, as well as flying out at speed like small, feathered, green comets. 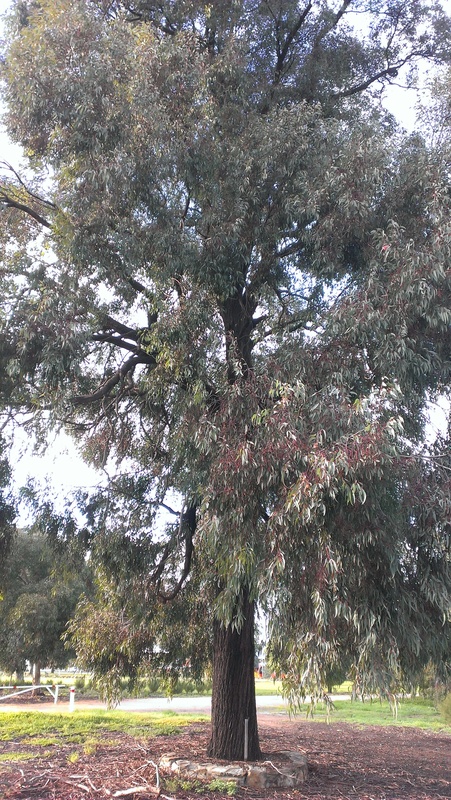 This next tree is an E Sideroxylon. 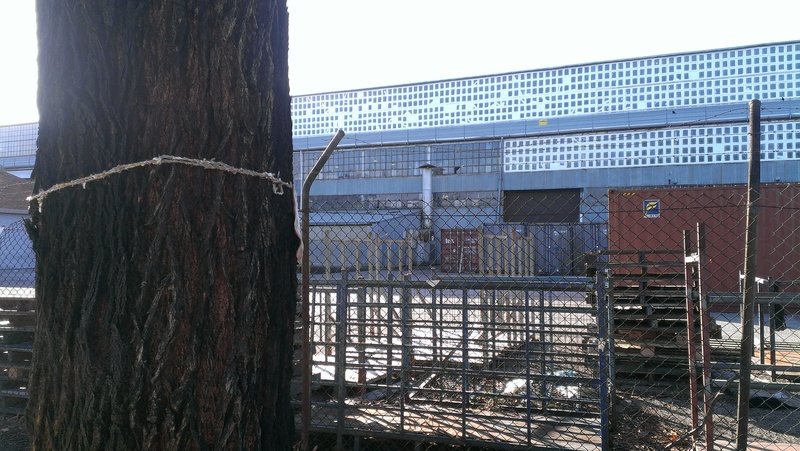 It stands outside the Le Cornu warehouse on Leader St. 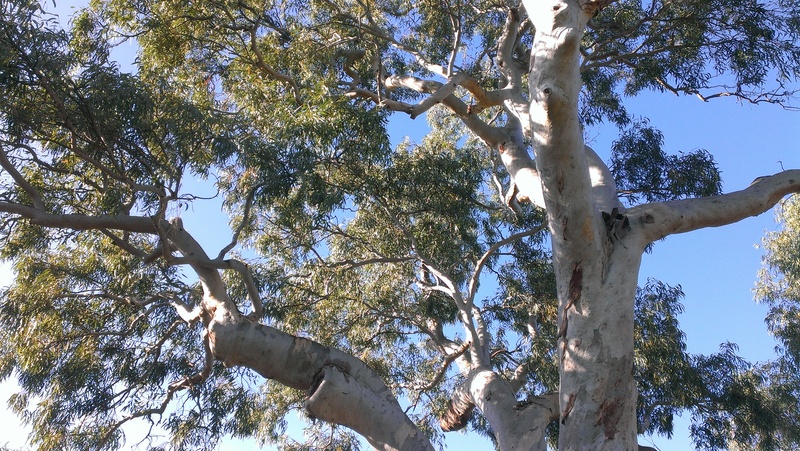 I used to be able to reach its lowest leaves, but the chainsaws took off the lower limbs some time back. It is still magnificent. The light wasn’t great for it, but since there is at least one appreciator of industrial buildings reading, here is a shot of the background. I oriented my banner toward pedestrians. Next, one of the largest E Cinereas in the neighbourhood, standing outside what seems to be a disused office in Leader St. Perhaps people work there but are not interested in the garden! It has suffered the chainsaw too, losing a truly huge bough. Finally, my old friend on the corner of Laught and East Sts. I thought this was an E Scoparia at first, but while the leaves give amazing colour, the bark produces a different result than other E Scoparias I’ve dyed with. Name, uncertain. Beauty, obvious. This time I was spared conversation with the tree hater who lives opposite this tree and can only see it as a source of litter. I was on the bike, so picked up a bagful of fallen dried leaves. When I have more carrying capacity I take fallen twigs and whatever bark or wood is lying beneath it in hopes of mollifying the tree hater. Fabulous. 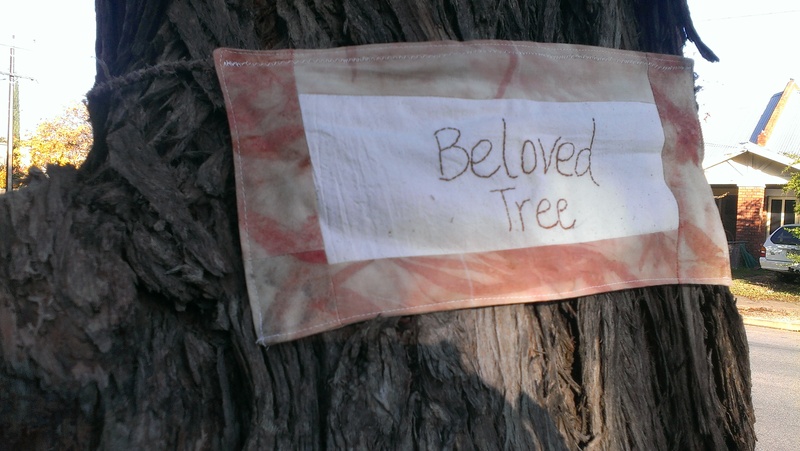 I must say that visiting all these beloved trees and wrapping my arms around each one… I did feel like a tree hugger. And proud! 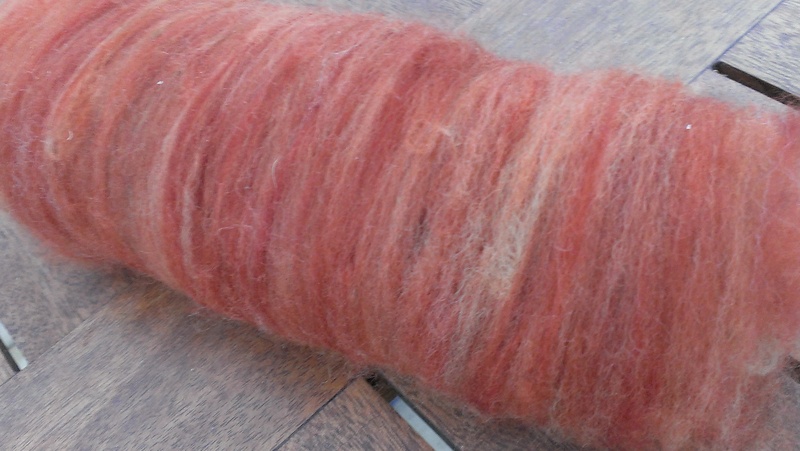 I divided my fleece up into colour groupings, carded it and pulled a roving straight from the carder drum with a diz. What a great technique. You can find it on YouTube, but it was watching a friend from the Guild demonstrate it that really convinced me to try it out. This Youtube video has an explanation of the same simple homemade diz my friend has made, so maybe she was inspired by that video. Here are my rovings. 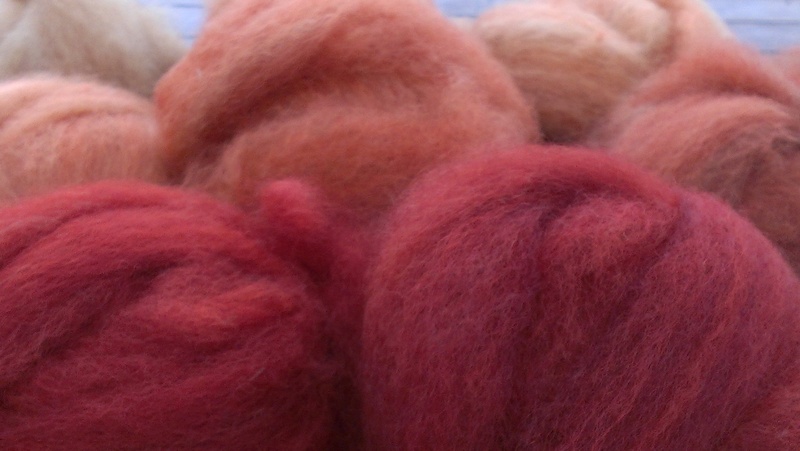 Creating these made me feel like I have learned a few things about fleece preparation. I am so happy with this yarn! I can’t wait to share it with the friends whose sheep this wool came from. Coincidentally, the week I finished this yarn, they invited me to their place for shearing time. I have a bit of a tendency to go a long way toward the completion of a big project and then pause near the end. Sometimes for a little while, sometimes for a long while. So here, finally, is the very last of the grey corriedale I dyed months ago and planned to spin during the Tour de Fleece. 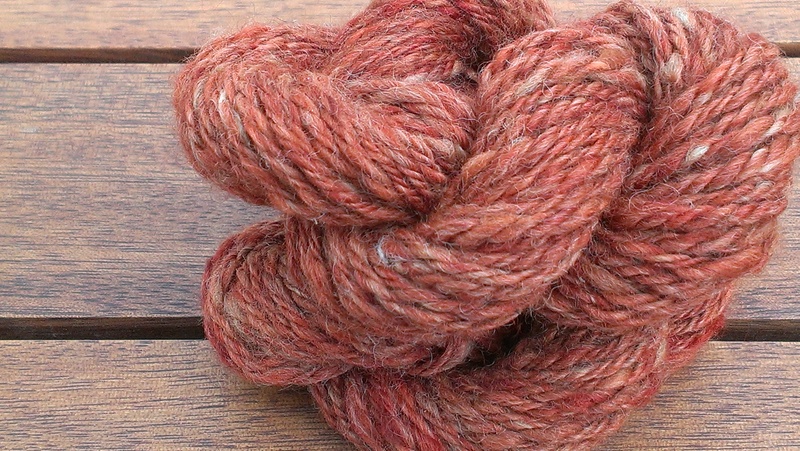 I loved the two ply yarn I created during the Tour a good bit less than my initial chain plied skein, even though it is what I need if I ever knit that cardigan I dream of. And chain plied the rest (one single plied on itself in a chain). I think the long pause on this was caused by the way my heart sank when I stopped chain plying it in the first place. 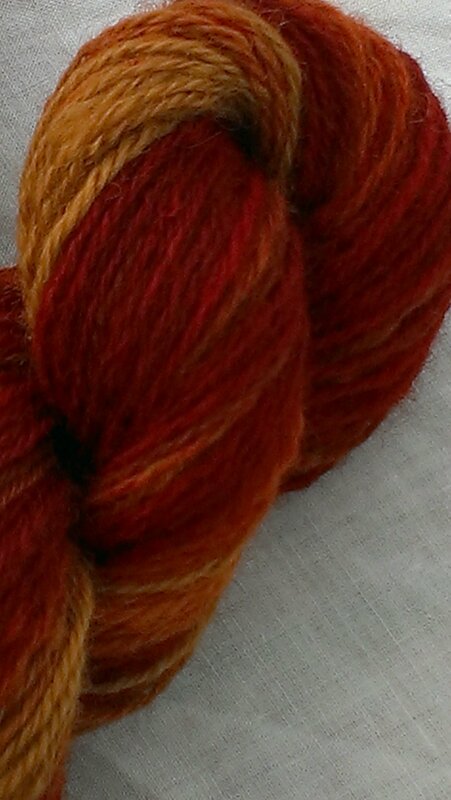 I love the distinct colours in the last little leftover skein! 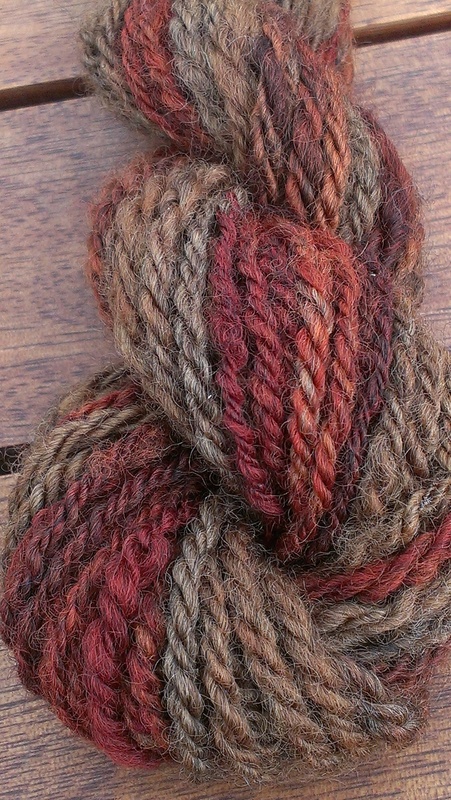 I also spun up a little batt of alpaca dyed in eucalyptus. We’ve had gale force winds here lately. One morning about a week ago, 40% of my city had no power when we woke up (we were happily still connected to the grid). Needless to say, this has led to windfalls, and I was still collecting them yesterday as further gale force winds began a week later. 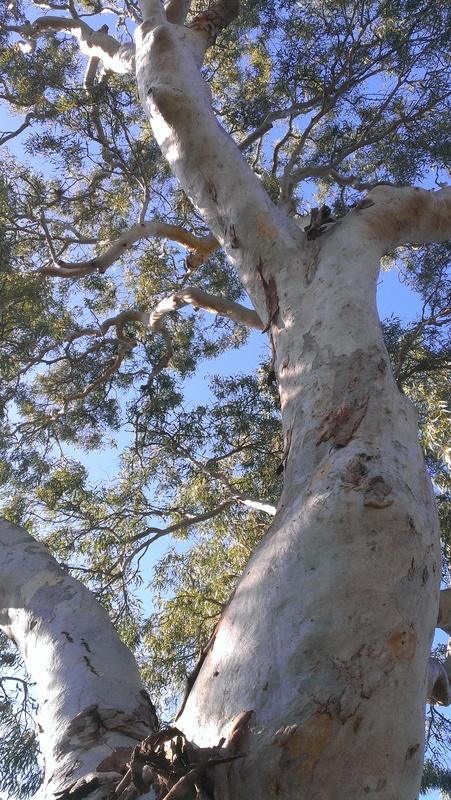 The first windfall was an ironbark. Guessing from its location (a stand of three ironbarks) and the gumnuts still intact, I think it is E Tricarpa. Sadly, just as unremarkable as a dye plant, as the last time I tried! 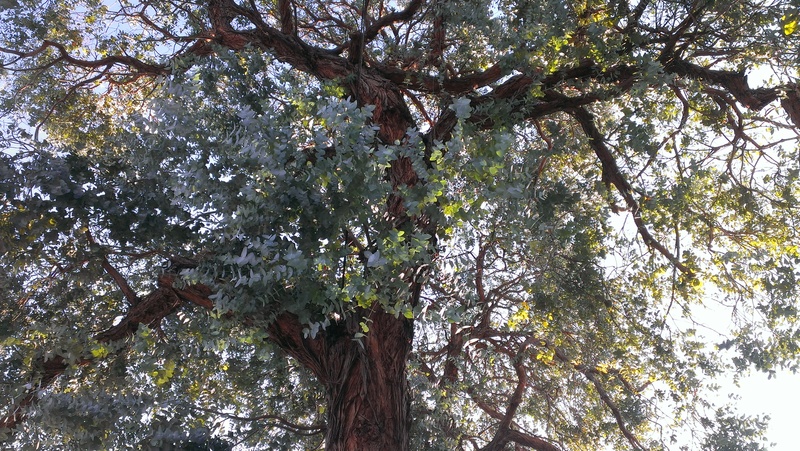 I have not managed to identify this tree, partly because it branches metres above ground level. Even with so much of its canopy on the ground, I didn’t find a single bud, flower or fruit to help me identify it. The trunk is rough and pale. The whole tree is difficult to capture in a photo, especially on such a gloomy day. It must be at least 20 metres tall. It seems to be under attack from some kind of scale insect. Every single leaf was affected. Here it is after some hours in hot water–suggestive of a beige outcome…. Compare my third windfall. 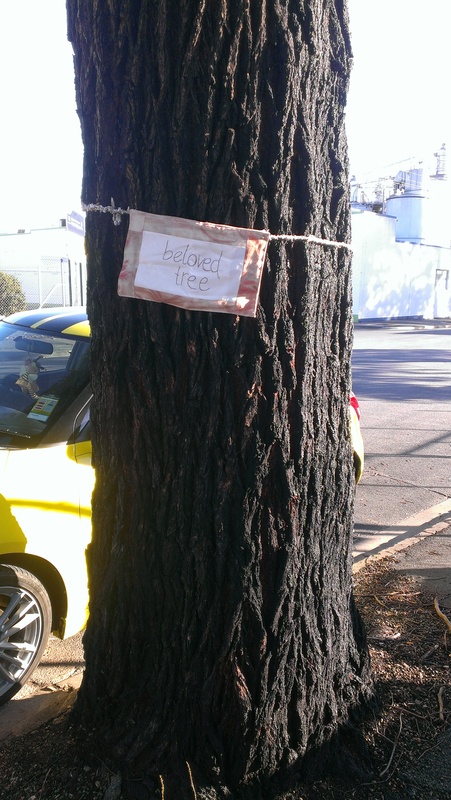 This is a tree that has been cut to accommodate cars parking beside it, in the car park of a recreation area. 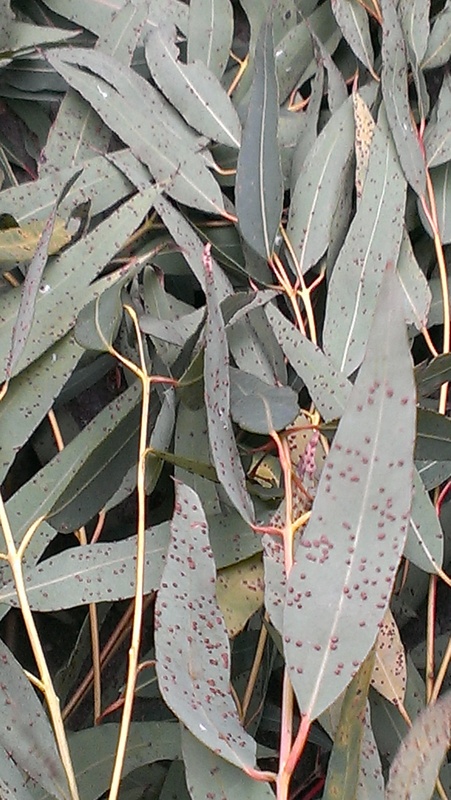 I haven’t been sure whether it was E Scoparia, E Camaldulensis, or some other unknown eucalypt. Both E Scoparia and E Camaldulensis have similar shaped and sized leaves, small fruit and both can have pale, smooth trunks (but this trunk looks more E Camaldulensis to my admittedly self-trained eye). The branch that fell to the ground had an uncharacteristically large number of fruit on it for E Scoparia. On the other hand, the clusters of seven fruit with 3 valves apiece made me think it might be E Scoparia after all. 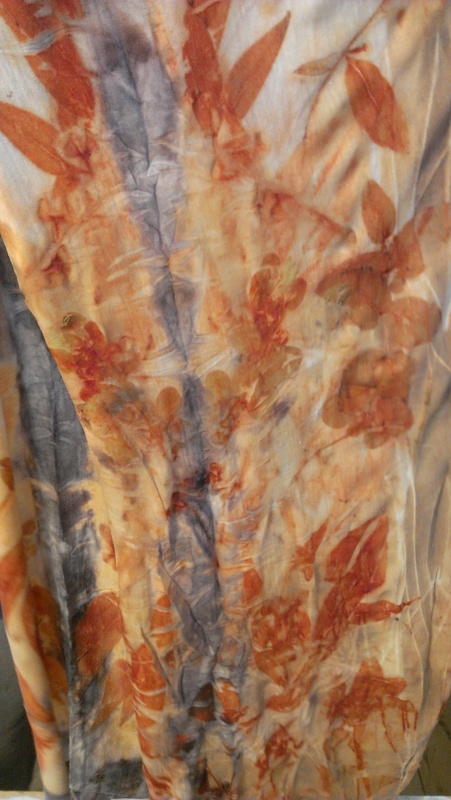 So did the colour of the dye bath, though the leaves did not turn orange the way E Scoparia usually does. 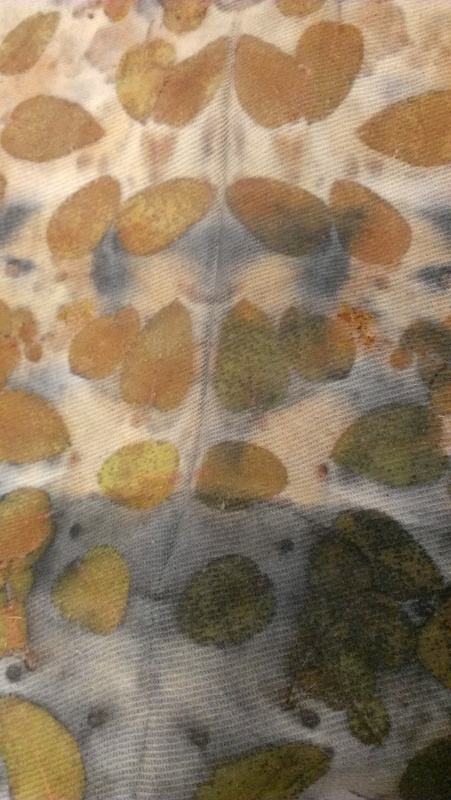 In spite of the colour of that dye bath, the result says that this is not E Scoparia, and the 3 valves say that it isn’t E Camaldulensis either (4 valves). 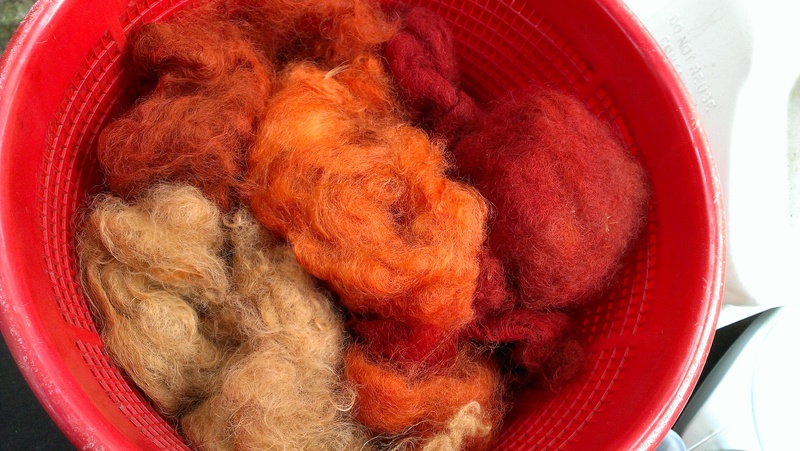 Even with vinegar to help bring out whatever orange or red might be there to be had, and still damp from the dyebath… the 3 valved tree is at the top (brown-beige?) 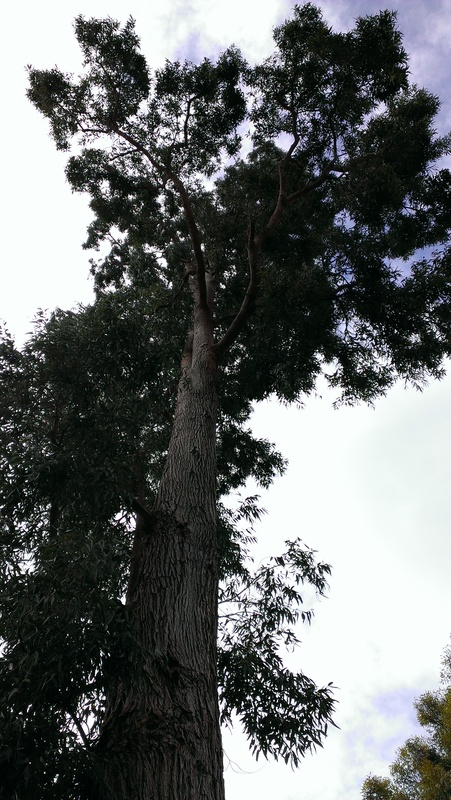 and the 20 metre tall tree is at the bottom (caramel-beige). 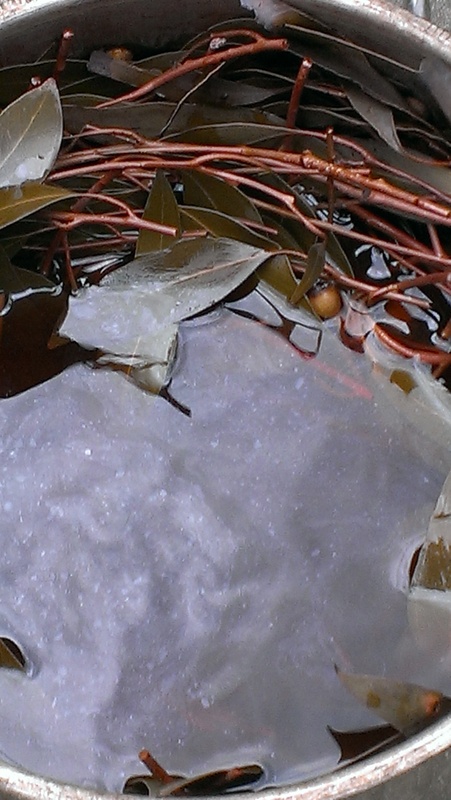 Here are the results of a bath with a fallen branch from an actual E Scoparia, downed in the same windy night. 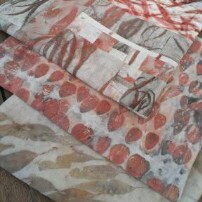 They’re the red and orange samples, with the E Tricarpa for contrast. The other day I was at an exercise class in a park. 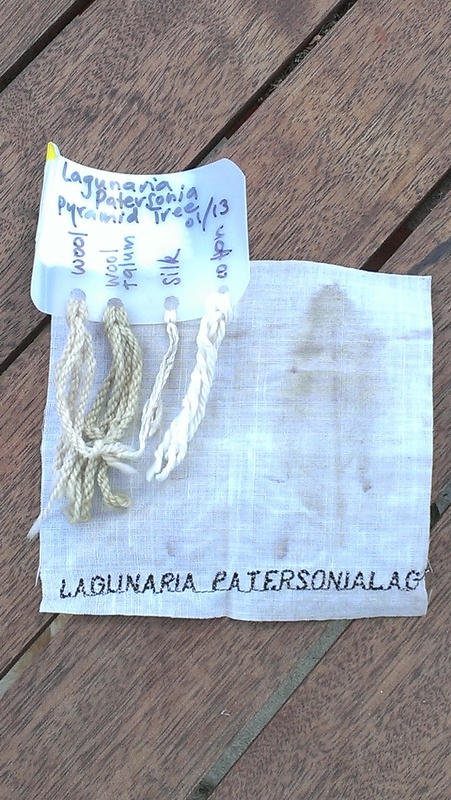 One if the trees was helpfully labelled Lagunaria patersonia (pyramid tree). 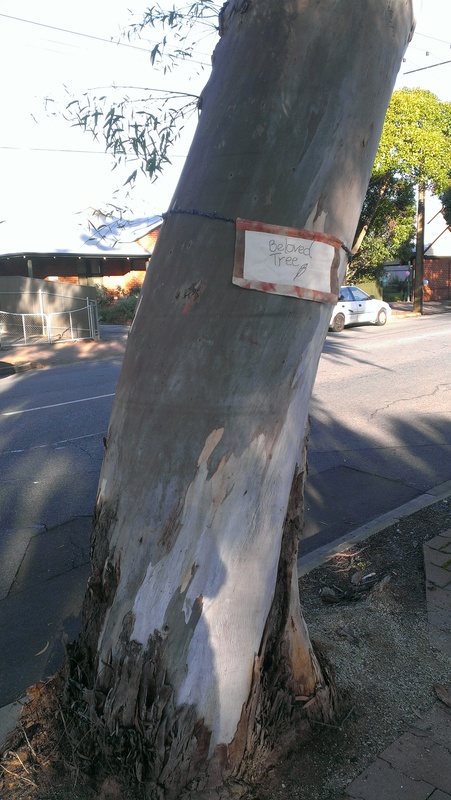 It turns out to be native (to Australia, though not to this part of it). 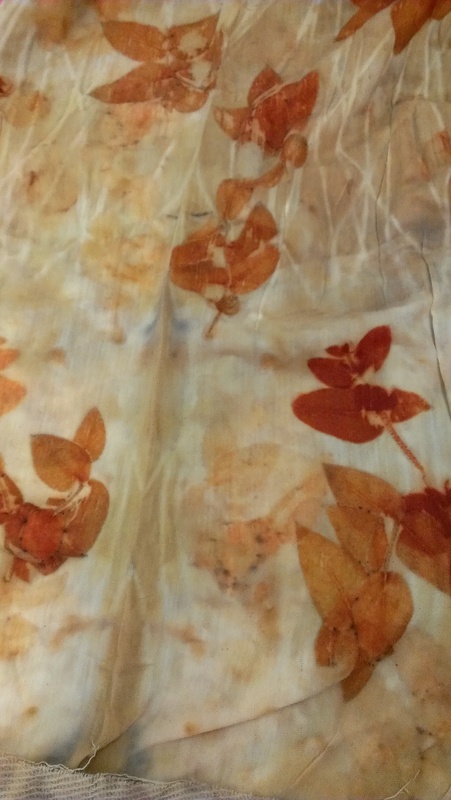 So… I decided to take a sample and test its dye properties. I am here to report to you, dear reader, that this is not one of the stellar dye plants of our time. That smudge on the right of the linen square with the questionable machine embroidery is the best I can show for a leaf print after an hour and with teh presence of iron and soy mordant. The only fibre on my swatch showing any colour after an hour of simmering is wool + alum, a delicate shade of yellow-green. On the other hand, I made these cushion covers from leaf-printed cotton and linen. They are for friends who invited us to a holiday house they share near Mittagong. I hope they’ll accept these as thanks for the lovely relaxing time we had with them. They are custom fit to the cushions on the verandah of their holiday house, whose covers have seen better days. I would have to say that the dye results are more consistent than my perception of the appearance of the trees! One happy outcome of paying more attention is that I have observed that at this time of year E Tricarpa (and some E Sideroxylons) have tiny buds in formation among the fresh young leaves, and this enables a confident identification as between them. 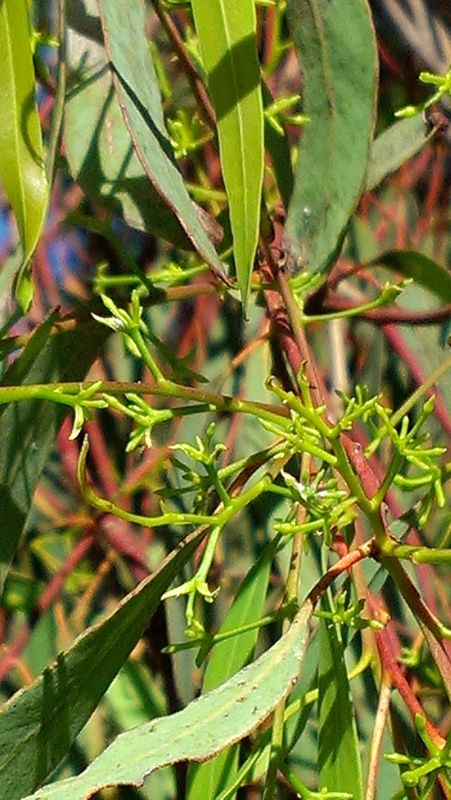 E Tricarpa has buds grouped in threes and E Sideroxylon has buds grouped in sevens. Sometimes fruits are so high in the tree I can’t tell, and sometimes the sample I am able to reach has umbels where some fruits have broken off but I can’t be confident how many. So this discovery is a help to the person trying confidently to tell them apart–me, for instance. 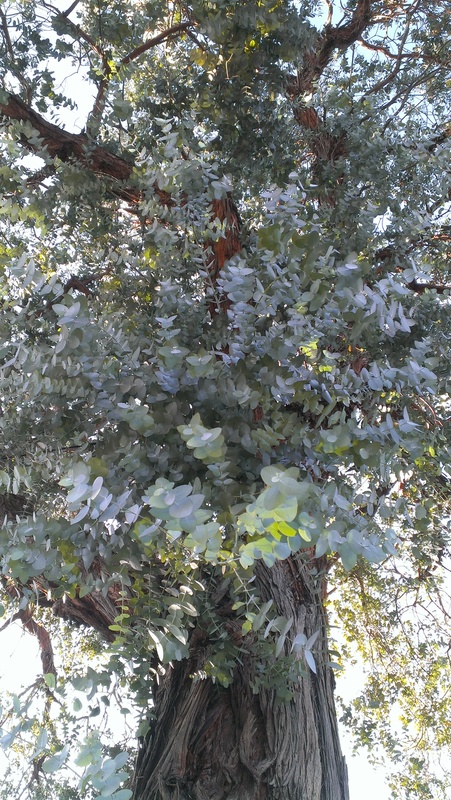 I need to go a little further afield to consider other variations on the theme, but for now I think I will consider wider-leafed ironbarks to be types I don’t know well, rather than assuming they are E Sideroxylon with a better supply of water and nutrients. You know what they say about assumptions! 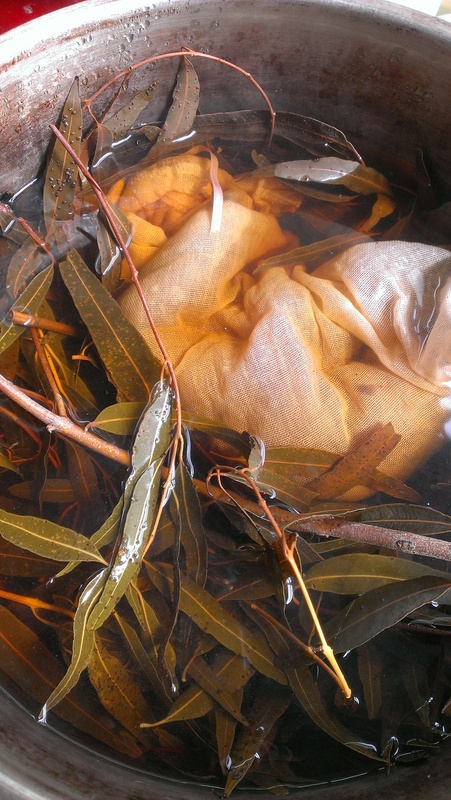 Let the ironbark identification and dyeing experiments begin! 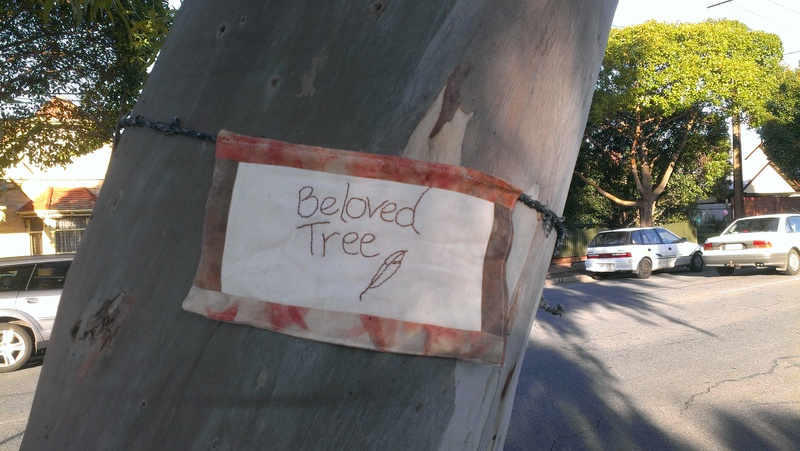 This tree is growing on the tram route in Goodwood. 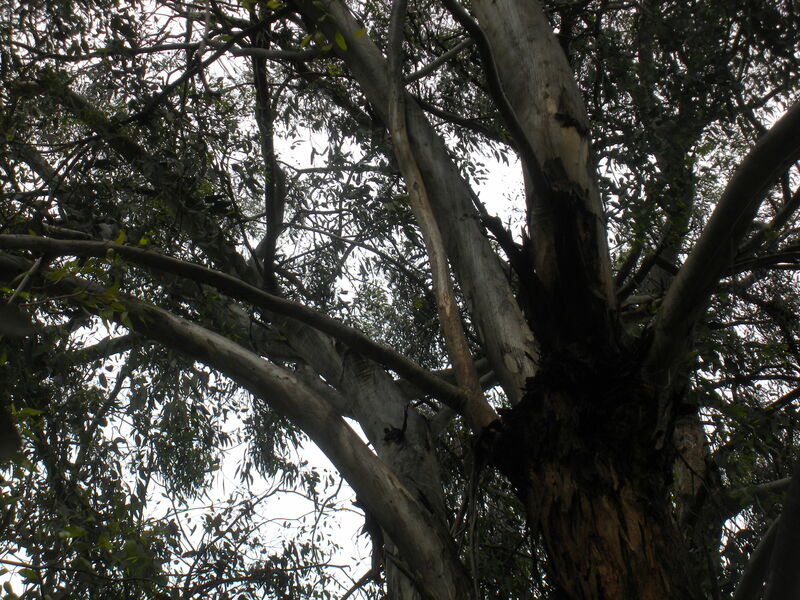 It is clearly an ironbark, but I am less certain it is E Sideroxylon, and thus, I chose to investigate further… There are three ironbarks in a little cluster at this spot. I think one of them is the same species and the other is so tall and branches so many metres above the ground that I may never know. 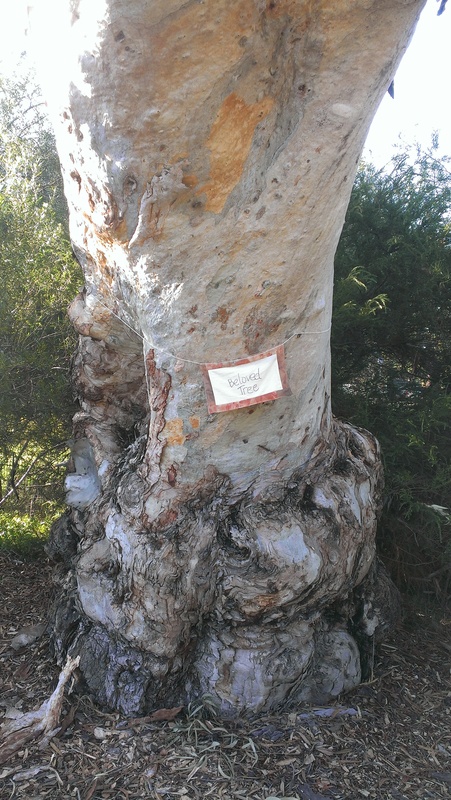 Here is the key feature of an ironbark: deeply furrowed bark which is impregnated with a sticky saplike substance (kino) which the tree produces in an effort to fend off attack by insects. 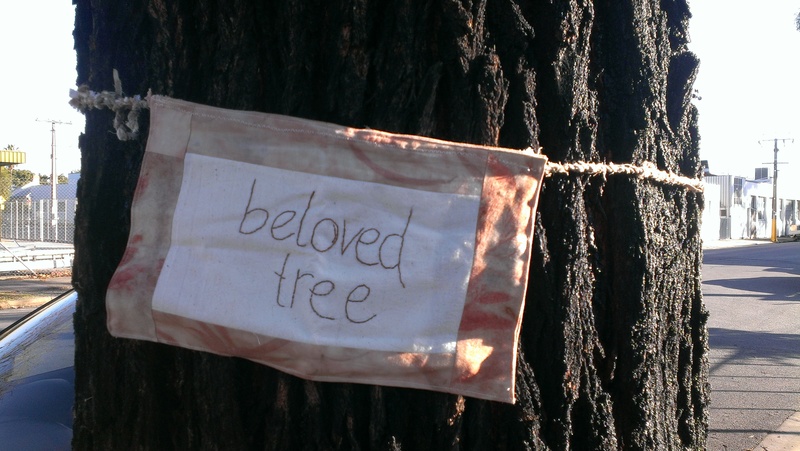 Here, more of a sense of the whole tree. 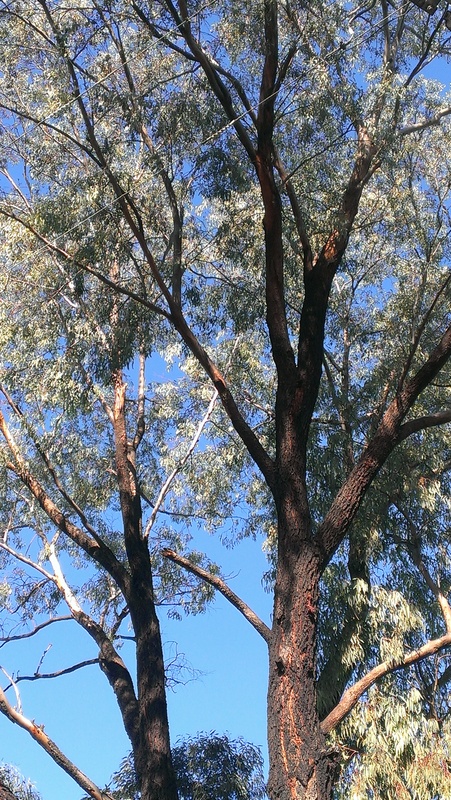 It is a very tall tree… and while the trunk might be secure from predatory borers, the leaves showed penty of signs of lerp and caterpillar attack. 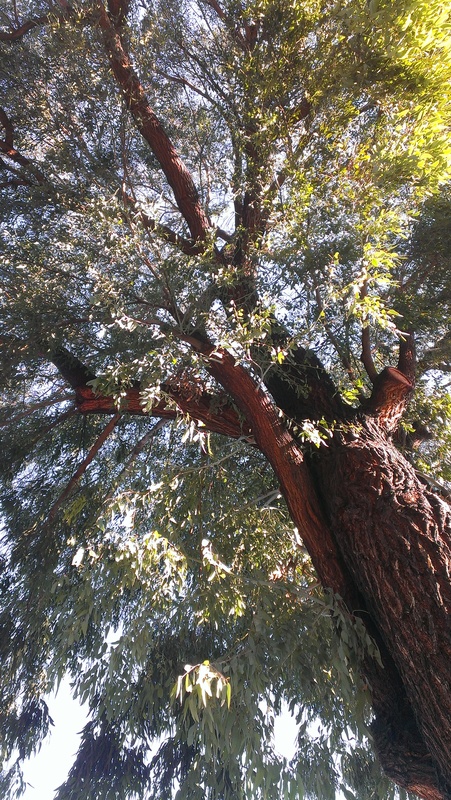 The upper branches were paler, more of a cream colour, and covered in smooth bark which had begun to shed. We had a very overcast day, but sometimes a natural dyer can’t wait! The leaves smelled rather lovely while cooking. 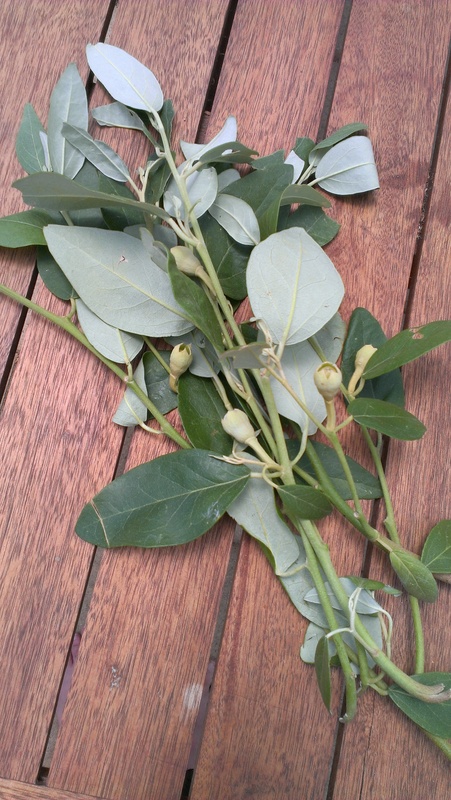 I didn’t imagine when I set out on this dyeing path that cooking eucalyptus leaves smelled different, except in the obvious case of ‘lemon scented’! They do though. 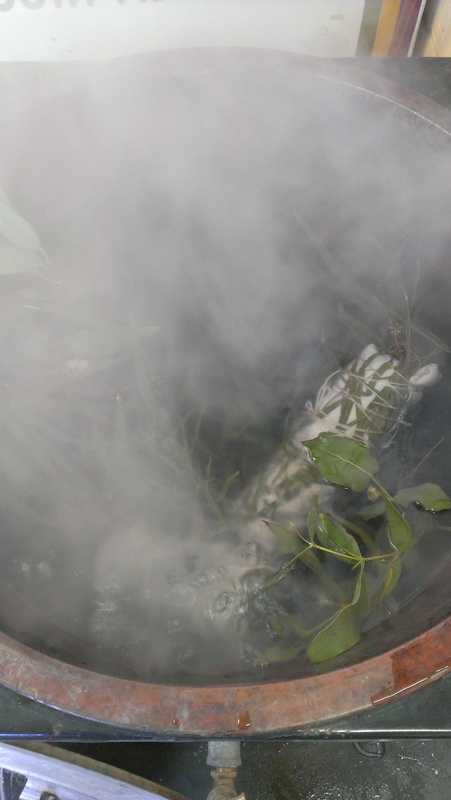 Some smell quite spicy and some smell like classic Eucalyptus oil. E Crenulata was so overpowering it was voted out of the house for all future time. 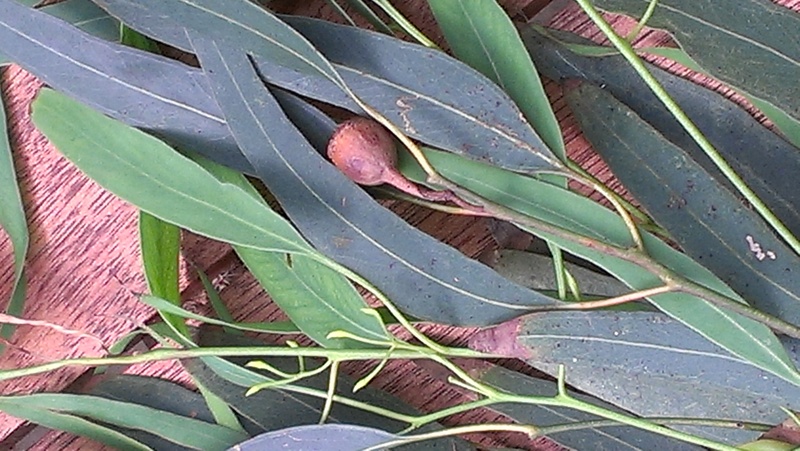 As for identifying features, I collected plenty of leaves but could not reach any mature fruit. Since this tree is growing among others that may not be the same species, picking fruit up from the ground sometimes just confuses the picture. There were no visible buds or flowers–so, there are some limitations on identification. Just the same, this tree appeared to bear fruit in pairs and threes (and not the classic 7 flower umbel of E Sideroxylon). Tentatively, Euclid, hampered by my inadequacies in providing accurate observations, and the limitations in the data available, gives me E Tricarpa. 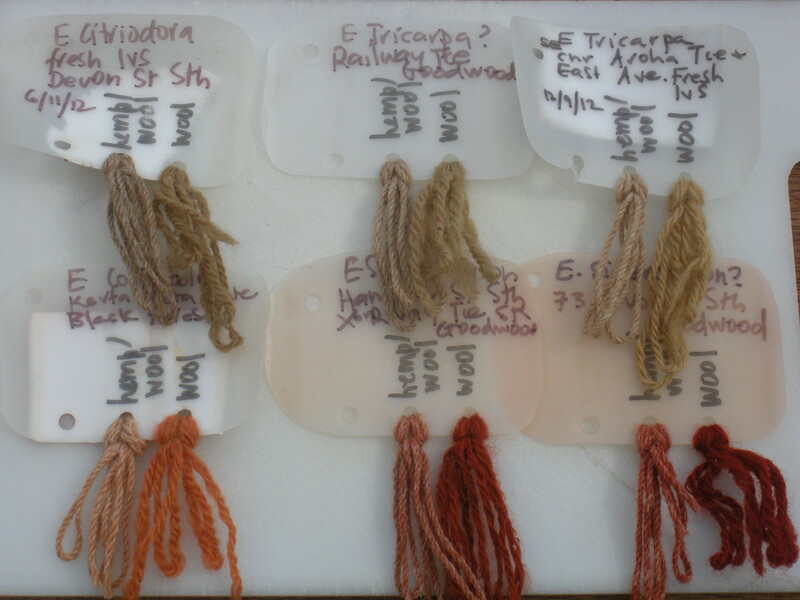 Here is the outcome of my dye sample (hemp/wool blend on the left and and wool on the right on each sample card). E Citriodora on the left and E Tricarpa (tentatively identified) on the right… equally unexciting to my way of thinking. 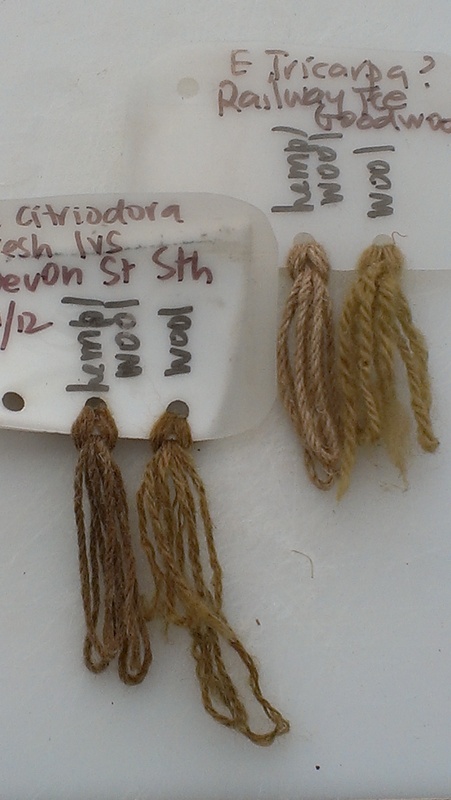 Tagged as E Citriodora, E Sideroxylon, E Tricarpa, local trees, neighbourhood dyeplants, not tan again!